July and August are always wild and crazy in a beach town. We've enjoyed meeting so many fun people this summer. Mother Nature was pretty cooperative and the weather was great. Apparently Innkeeper Seely was on a roll in the kitchen because the guest book is full of positive comments about breakfast, cheese cake and fudge cake packages and wedding cakes. Wedding cakes? Yes, it has been a remarkable summer for weddings and elopements in Narragansett hosted by Blueberry Cove Inn. Suddenly our Elopement Package and our Family and Friends Wedding Package became very popular. Are you ready for some photos? On July 3, 2013, Mark surprised his wife Julia with a Vow Renewal Package. 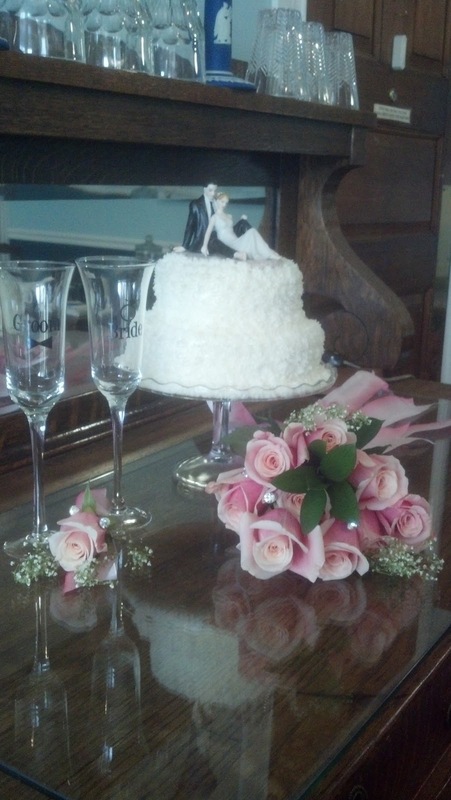 Her bouquet was a sweet mix of roses, daisies and alstromeria. Megan and Rich, July 12, 2013 had their ceremony and reception at the Towers. They hosted their rehearsal dinner in a tent on the inn's lawn the previous evening as a part of the "Events on the Lawn Package". 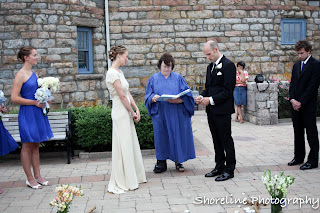 Amber and Kate, August 6, 2013 chose to have their ceremony on the inn's lawn under the huge maple tree. Leigh and Betty, August 8, 2013, wanted to be married on the beach. The ruins on Scarborough Beach provided a lovely backdrop for their ceremony. Eleanor and Katie, August 12, 2013, loved the views of the ocean and lighthouse at the Fisherman's Memorial. It was a beautiful spot for their elopement. 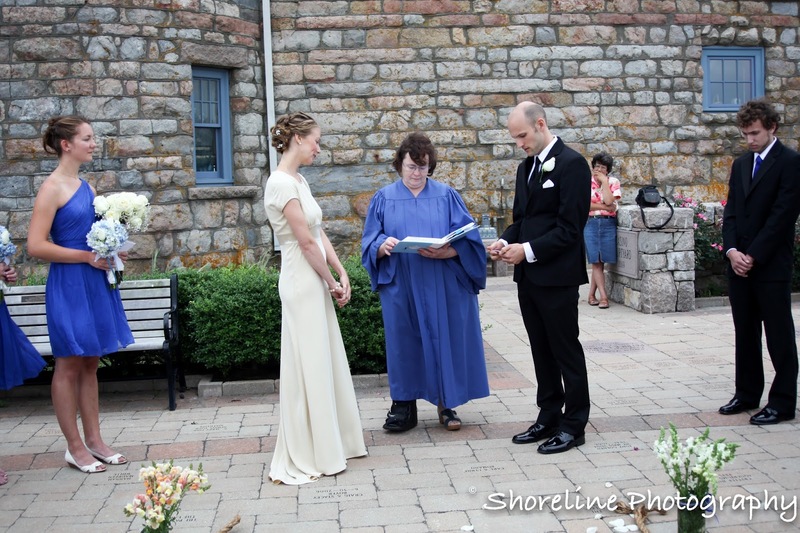 Angel and Jaime, August 15, 2013, brought their family to the Narragansett Town Beach for the ceremony. Their children decorated the beach with a shell and rose petal lined heart. Their "Family and Friends" package included a reception for 20 back at the inn. Paul and Heather, August 24, 2013, also found the ruins and Scarborough Beach, to be the perfect setting for their wedding. Derick and Emily, August 26, 2013, wed on the Narragansett Town Beach with their four-year old daughter as their "attendant." I felt honored to be selected by these couples to perform their ceremonies. Being around such happiness is intoxicating. What's that? you want to know about the cakes? Let's just say that Swiss Meringue Butter Cream icing is becoming my new addiction.That is a topic for another blog post. With 400 miles of coastal waters Rhode Island has constructed a number of lighthouses over the centuries. Although you can see a few of these from land the best way to see them is by boat. Save the Bay Foundation is sponsoring very special tours which include viewing 20 lighthouses from the water and actually touring the Rose Island Light. If you can't make those dates or spend an entire day on the water you might want to check out Rhode Island Bay Cruises which offers 90 minute cruises to view 10 lighthouses. Try to make your reservations in advance though as these are extremely popular. We all want to get away. We all deserve to get away. We should all go away - to Narragansett and the Blueberry Cove Inn of course - soon. As an innkeeper I feel that it is my duty to help you get away by offering a June discount. June is a lovely month and you really should experience a break by the sea before the crowds come down next month. Or golf. Or fish. Or shop. Or indulge in history. There is something for everyone to do. Unfortunately I can't accept third party gift certificates for this offer. And it will end June 27, 2013. So what are you waiting for? Tell your boss you need two personal days and book now! 4) In the center of everything. Yes, Narragansett is on a great ocean-facing piece of land and it has lovely beaches and weddings. But it is also within a 15 to 30 minute drive to many other destinations. One of the most popular is Newport. Lots of people run over there to shop, tour the mansions, experience the nightlife and explore the bird sanctuary. Others revel in the history. Well, this deal is for the latter. Groupon has a discount for two historic walking tours produced by the Newport Historical Society and the Newport Restoration Foundation. To quote the deal, "Walking tours explore the history of colonial Newport and Newport during the Golden Age." So, if you are into history, walking or just doing something different AND like a bargain, check out this offer. Note: no one at Groupon, the Historical Society or Restoration Foundation knows who the heck I am so I'm not getting any kickbacks for sharing. Sometimes guests ask me how I learned to do most of the construction and maintenance jobs that I have tackled. (Or have been too foolish/poor/stupid/stubborn to hire out.) Back in the olden days I watched "This Old House" when the homeowners actually did a lot of the construction themselves. It didn't seem that hard. Then I found books that spoke in a language that I could understand. Trial and error contributed greatly to my knowledge base. My brother-in-law taught me to sweat copper pipes. But it was my mother's can do attitude that really shaped me. She taught me the basics that a girl would need in the areas of cooking, cleaning, sewing, handicrafts and gardening. 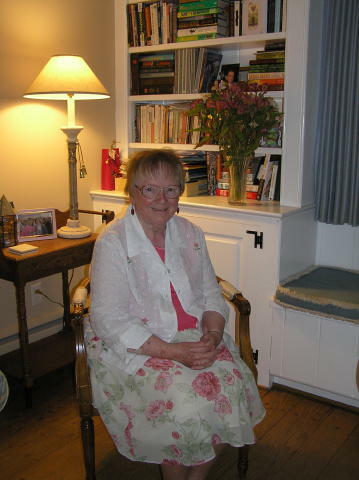 She encouraged me to have curiosity and to think out of the box in problem solving. In some leap of enlightenment I began to just translate traditional "girl's jobs" into construction terms. So when there is a hole in the icing because you cut the opening for the electrical box wrong, get out the icing piping bag and get to work. First make sure the electricity is turned off. Mix a bit of plaster of Paris a little on the damp side - sort of between the texture of Greek yogurt and set pudding. Use either a cake piping bag or heavy plastic bag with the corner cut off. Don't bother using a cake decorating tip. Roll up the bag and gently squeeze the plaster into the openings outside of the metal box to fill the hole. This technique was tidier than filling the areas with a putty knife. It allowed me to put a thicker bead of plaster evenly into the space. The tip of the bag squirted the plaster behind the metal "ears" of the box and self-leveled so there weren't any annoying air gaps. I'm sure a professional plasterer would roll his eyes at these instructions but they sure Worked for Me on Wednesdays. Happy Mother's Day Mom. Thanks for all you taught me. bill that was signed into the State's laws yesterday afternoon. I have long been a believer in equal rights and tolerance. I live in a state that was founded on freedom of religion when Roger Williams was booted out of Massachusetts for not being a good Puritan. We have the oldest synagogue in the country just across the bridge in Newport. And now we allow every human being to marry the human being of his or her choice. How great is that??? Obviously this is a contentious issue and not everyone thinks it is great. But here at Blueberry Cove Inn, I want to celebrate everyone's happiness. I want to embrace new families from every walk of life. I want to be dizzy from dancing, tipsy from the champagne toasts and sneezing from all the wedding flowers. So to everyone, even if you don't get married here, have a blast at your wedding. To all, straight and gay and lesbian, celebrate your way and have a happy life together. French toast is one of my favorite breakfast foods. This variation is officially in the Blueberry Cove Inn lineup after mid-winter trials. It meets all the criteria for an easy and versatile dish: it is prepared the night before so it is ready to bake when I roll out of bed; the fillings can be varied by season; it is easily reduced or increased depending on how many servings you want to make; and it holds fairly well after baking when the guests come to the table a little later than expected. I pull Texas toast slices out of the freezer to throw the dish together. The bread thaws and absorbs the egg mixture overnight in the fridge. I think it is easier to spread the cream cheese and preserves on frozen bread than it is when using thawed bread. Some days I have a thicker layer of cream cheese. Some days I'm more in fruit mood. As long as you have about the same amount on each serving it will cook evenly. I saw something similar on Pinterest using peanut butter and bananas. (I want Fluff on those.) Let your imagination run wild with fruit and preserve combinations! Enjoy! Butter or spray a 13x9 pan. Spread cream cheese on six slices of bread. Spread preserves on top of cream cheese. Place in pan. Arrange blueberries evenly over the preserves. Top with remaining bread slices. Beat eggs well then mix in milk or cream and flavorings. Pour evenly over the bread. Cover with plastic wrap and refrigerate overnight. Preheat oven to 375. Tip pan and spoon any extra egg mixture over tops of the bread. Cover with foil. Bake 30-45 min. or until all liquid is absorbed. Allow it to sit a few minutes before removing from the pan.